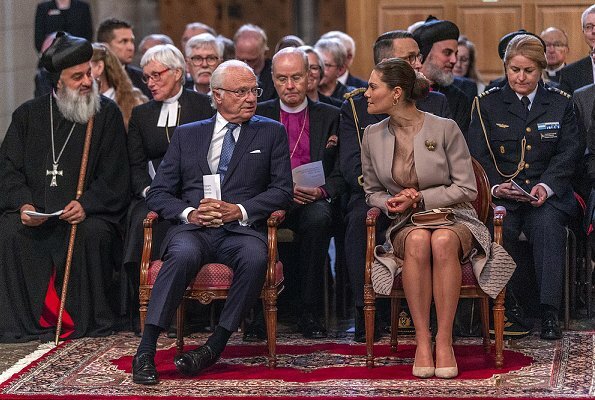 On October 2, 2018, King Carl Gustaf and Crown Princess Victoria attended the opening of Kyrkomötet 2018 in Uppsala. 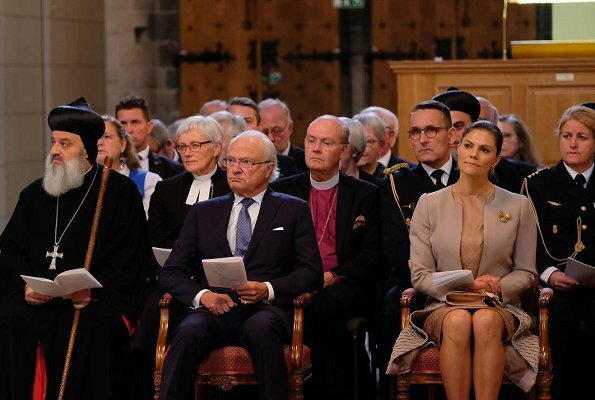 Church Council meeting which is the highest decision-making body of the Swedish Church began with a service at Uppsala Cathedral under the chairmanship of Bishop Mikael Mogren. 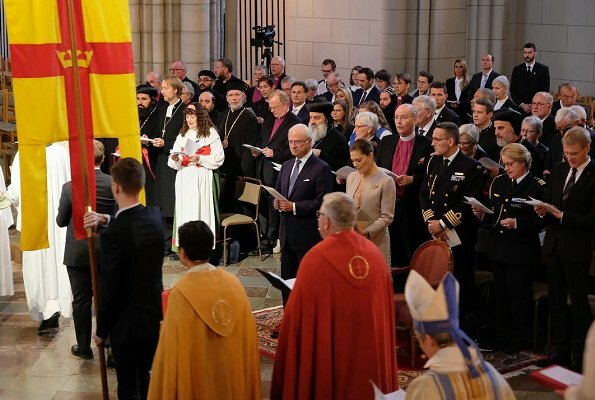 The General Synod is the Church of Sweden's largest decision-making body and it consists of 251 members from throughout Sweden. 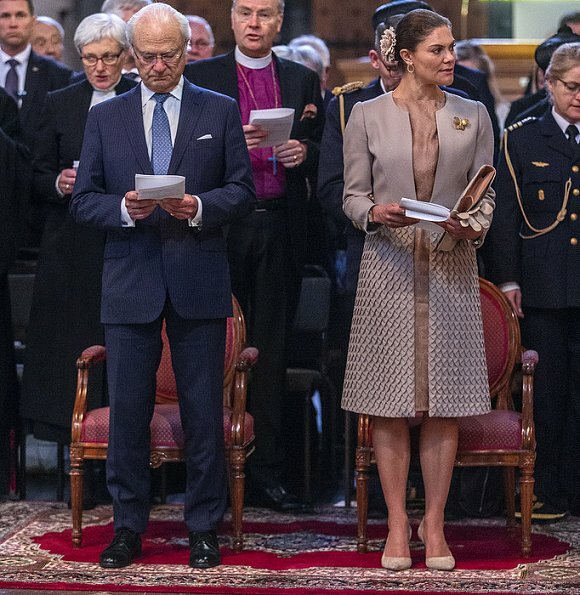 The Church of Sweden is Sweden's largest member organisation and it has 6.3 million members. The General Synod is elected by the church's members. Colours don't match. Beige dress with grey coat?. Not a becoming combination. I don't thinj this is a grey coat, this are two different coloirs of beige, ton sur ton. Really liked this dress on Mary in 2013. Shame it is covered up with this odd mismatched coat today. On Mary? I've never seen it on Mary. At what occassion? Sorry, meant to write Victoria. 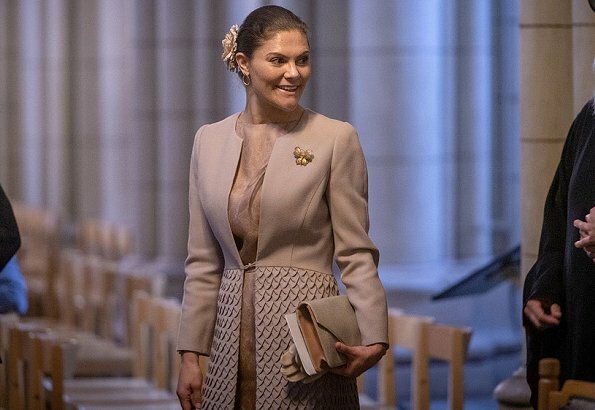 Another site said the dress was antique pink and the coat a textured lilac. Still does not match I am thinking. 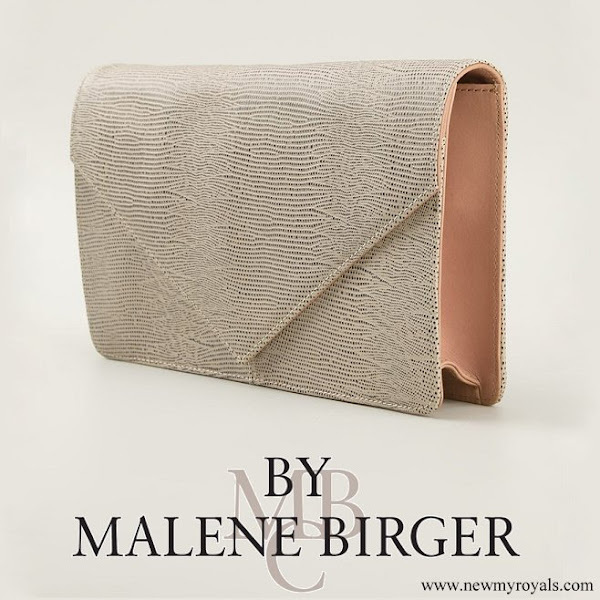 Sophisticated and beautiful combination of two light brown colors. She looks very good and relaxed. A very chic and sophisticated look, imo. Well done, Victoria! Boring length. She looks old. Elle vous a entendue ,elle a raccourci la robe ! She is dressed for the occasion. I don't think this is is aging her like her frumpy floral frocks do. It also looks like the colors may have come from her bag, although it is difficult to tell with the lighting. I don't dislike the combination of colors, but I find the entire outfit aging and unflattering when combined in this manner. I did like the dress on its own in 2013.